The old guard that ruled Libya under Muammar Qaddafi is beginning to trickle back into public life, drawing on the Libyan people’s despair with the civil war and the chaos that followed the dictator’s overthrow and death in the NATO-led revolution of 2011. This process was quickened by the release last week of Saif al-Islam Qaddafi, the late Muammar’s son and designated successor, by the Abu Bakr al-Siddiq Battalion. This militia that rules the western town of Zintan captured him in 2011, three months after his father was killed, and held him for seven years. 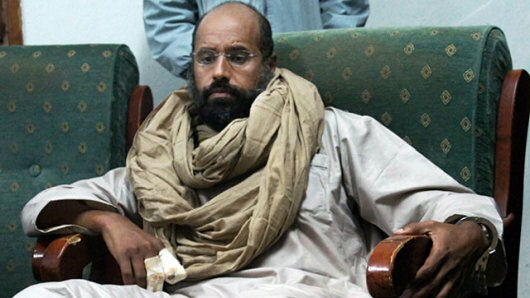 Since his release on Friday, June 9, the 44-year old Saif al-Islam has dropped out of sight and is rumored by Western intelligence sources to have arrived with armed guards at Beida or Tobruk in eastern Libya. In the western region, he is still a hunted man. The UN-backed Libyan government in Tripoli condemned his release. In 2015, he was sentenced in absentia to death by firing squad, following the trial of thirty ruling members of the Qaddafi regime. DEBKA Weekly’s intelligence sources can now reveal that Saif al-Islam, who was instrumental in building his father’s regime’s ties with the West, has gone straight under the protection of former Field Marshal Khalifa Haftar, commander of the eastern-based Libyan National Army (LNA), which is deemed renegade by the Tripoli government. Haftar is actively aided militarily by Egypt and the United Arab Republic in his wars on Islamist extremist and rival militias; he is accepted by Saudi Arabia, Jordan and Russia and backed by parts of the US administration. A former general under Qaddafi, he appears to offer some hope for restoring stability to a nation torn apart by hundreds of militias and rid the country of Islamist terror. His opponents fear he will turn back the clock on the 2011 revolution. And indeed, Haftar’s growing power and promise of security, combined with the release of Saif Al-Islam, appears to be paving the way for a restoration of the old regime under Muammar’s son, with himself at the head of the armed forces. The gradual return of pre-revolutionary figures to public life, starting in the east is beginning to ripple over into the west. In late May, Ali Kana, Qaddafi’s former military commander for southern Libya, put together an armed force and took over one of the Libya’s largest oil fields. If these beginnings ripen, they may herald the restoration of Qaddafi rule to large parts of Libya, most extensively in the east and the center, where Libya’s oil fields and export ports are concentrated. For Libya’s Islamists, a neo-Qaddafi regime powered by Haftar presents an existential threat, no less than the menace posed by Abdel Fatteh El-Sisi’s government in Cairo. These extremists are likely working to set up a coalition for unifying all the militias with links to Al Qaeda or ISIS for the fight against the incoming power. At present, Al Qaeda is still strong in Libya, even after the disbanding of its local arm, Ansar al Sharia, enfeebled such franchises as the Benghazi Defense Brigades in the east. As Haftar gains ground in the west, Al Qaeda will seek greater penetration of the armed Islamist groups in the east, and intensify insurrection to his authority, like the current insurgency in Benghazi. ISIS, too, is also taking advantage of the Haftar army’s engagement in civil uprisings to move ahead with the reconstitution of its Libyan cells and recruitment. It is important to note that the May 23 suicide bombing at a pop concert in the British town of Manchester, which left 22 dead and 58 injured, was plotted and engineered in Libya. This discovery should send a red alert not just to the UK but the West as a whole, given this North African nation’s close proximity to Europe. As the young Qaddafi and Gen. Haftar gain strength in Libya, so, too, will international terrorists intensify their fight to preserve their jumping-off base of operation for terror.